Courtesy the artist and Victoria Miro, London © Secundino Hernández. Build and destroy, that’s what Spanish painter Secundino Hernández does. He builds layers of paint on big canvases, then strips them away, constructs visual compositions and tears them down. That’s the ‘step’ of the title, ‘Paso’: steps of painting, meaning and process. Sounds bloody exhausting. The opening room here is full of colour. Canvases with thick, bulging, 3D blobs of paint sat on flat planes. Black swoops, big globby mountains, expanses of orange and green, all split up, minimal, distanced. Upstairs, the colour disappears. Plain black and white canvases, painted then erased with a pressure washer. They’re like Lucio Fontana paintings left in the sun, or peeling public billboards. 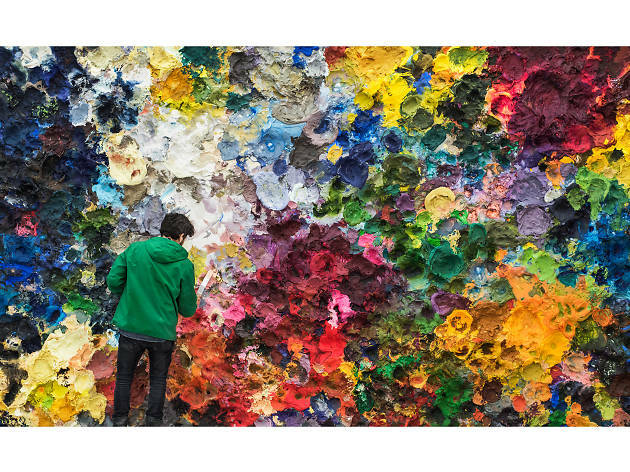 In amongst all this is a giant palette-esque painting of clashing colour, heaving mounds of thick goo, every hue imaginable, splurged together. It makes you feel lost, dwarfed by pure pigment, adrift in an ocean of reds and purples and yellows. Suffocating, but…in a good way. Is Hernández great? Is he offering anything particularly different to any other abstract artist of the past 100 years or so? I’m not convinced. But he does have a good compositional eye, and there’s something about abstract painting on this scale that makes your mind sprint. The works become spaces for projection, the total lack of signs make you create your own. Do you see alien moonscapes? Crashing waves? Spring gardens? Dancing lovers? Do you see a simple interplay of shapes? Or do you see something grander, do you interpret the movements on the canvas as an expression of the artist’s emotions? Really, Hernández’s work is all of these things and none of them. It’s just blank aesthetics for you to get lost in – you just have to take that step.